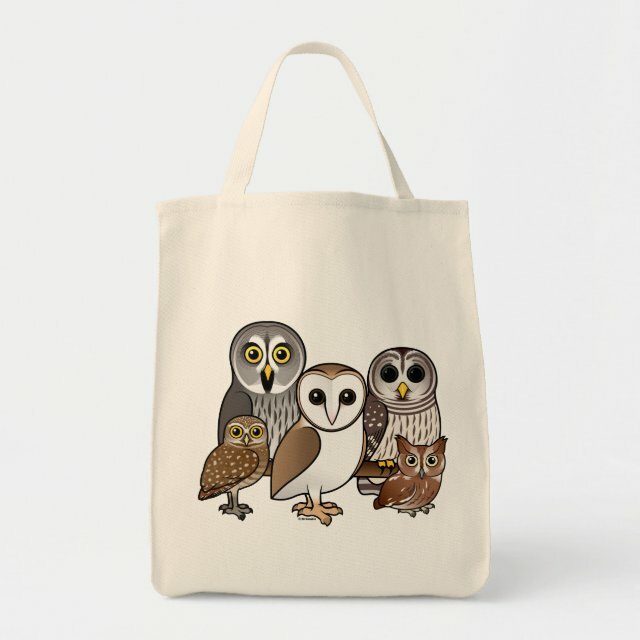 This design features five of our cute Birdorable owls perched together. The owls are: Great Grey Owl; Barred Owl; Burrowing Owl; Barn Owl and Eastern Screech Owl (red morph). This will make a great gift for owl lovers and bird watchers. You can totally customize this gift! Add text, change the color, move the owls around, pick a different style - make it your own! Grocery Tote Help the environment with this organic grocery tote bag. Wide bottom makes it easy to fit groceries or large items. Durable 12-ounce cotton twill. Cotton web handles reinforced with stress-point stitching.